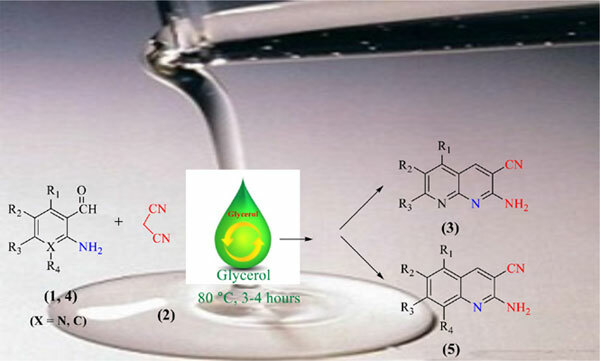 We describe herein the use of glycerol as an efficient and sustainable approach for the synthesis of 2-amino-1, 8-naphthyridine-3-carbonitriles and 2-amino-3-quinolinecarbonitriles. The catalyst- free reactions occur straightforwardly using biodegradable and non-hazardous solvent. It is a strategy to address mounting environmental concerns with current approach includes the use of environmentally benign solvent, simple workup procedure, economic viability, shorter reaction time and providing good to excellent yield. Glycerol, naphthyridines, quinolines, biocatalyst, bio-renewable, eco-compatible.